As neuroimaging becomes more widespread, it is increasingly being used in the courts, even though understanding and interpreting neuroimaging methods and results can be very challenging – even without attempting to evaluate their potential applications to forensic questions. The sheer volume of available information, research results, and opinions can seem intimidating to forensic practitioners and to mental health professionals in general. This will be the first book dedicated to this important topic. Designed as a reference for forensic psychiatrists, it starts with a brief overview of the psychiatric applications of the primary neuroimaging techniques currently in most widespread use, positron emission tomography (PET), single-photon emission computed tomography (SPECT), and magnetic resonance imaging (MRI). Subsequent chapters explore the current and potential uses of neuroimaging in civil and criminal forensic contexts. Diagnostic categories addressed include traumatic brain injury, dementia, psychopathy, paraphilias, psychoses and mood disorders. Legal concepts such as admissibility, relevance, and standards of proof are reviewed as they relate to the possible uses of neuroimaging findings in legal proceedings; prior precedents and court decisions are also reviewed. Novel potential applications of neuroimaging, including detection of deception and identification of memory or recognition, are addressed in dedicated chapters. There is a growing body of writing on the ethical implications of neuroimaging in the legal context, but this has largely been in bioethics journals that have limited readership among members of the mental health profession. Ethical questions generated by the rapidly evolving field of forensic neuroimaging are explored in detail in a dedicated chapter. 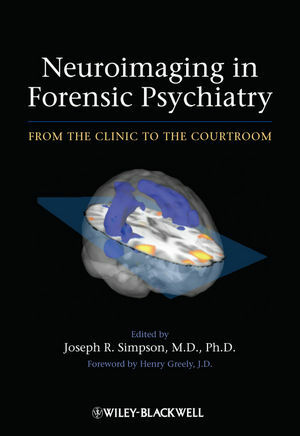 This book will be of great use to practicing forensic psychiatrists, forensic psychologists and forensic neurologists as they are increasingly likely to find themselves being asked to give professional opinions regarding the impact of neuroimaging findings on medicolegal questions such as competence, criminal responsibility, personal injury and disability. The book will be an invaluable resource for forensic practitioners seeking to understand and navigate this new area. Joseph R. Simpson received his undergraduate degree in biology from Harvard University. He received his M.D. and Ph.D. from Washington University in St. Louis. His thesis work focused on neuroimaging in mood disorders and the functional neuroimaging of cognition-emotion interactions. After completing his adult psychiatry residency at the University of California Los Angeles Neuropsychiatric Institute/West Los Angeles VA Medical Center, he completed a forensic psychiatry fellowship at the University of Southern California. He is board-certified in psychiatry and forensic psychiatry. He has published several peer-reviewed articles in neuroimaging and in forensic psychiatry. Dr. Simpson is currently a staff psychiatrist with the VA Long Beach Healthcare System in Long Beach, California. He is a Clinical Assistant Professor of Psychiatry at the University of Southern California and the University of California, Irvine. He also maintains a private practice in forensic psychiatry.